A growing maker mentality and availability of tools and resources, makes it much more accessible for families to make with tech. Here at Tech Age Kids we're trying to steer families away from purely being consumers of technology. A company like, Technology Will Save Us, has a similar mission and helps the community by developing kits which unlock the "secrets of tech" and allows you to make with tech. One such kit, is the Mover Kit, which we've reviewed before here on Tech Age Kids. It's been a wonderful device to have in our non-techie family and I love that my kids are able to make with tech, without it being overly scary for us non-techie parents! My son, has been wanting a Star Wars lightsaber for like forever. Over Christmas he very nearly bought one, but then realised he didn't have enough pocket money. Oh yeah, cruel mum! 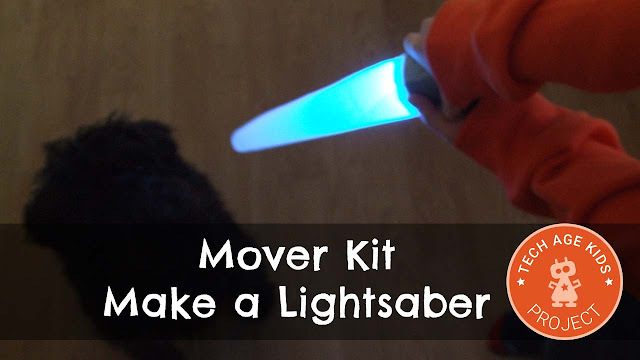 He did however get a Mover Kit for Christmas... so he thought perhaps he could make a light saber. In this quick post, we'll show you how we made our lightsaber using the Mover Kit by Technology Will Save Us. It's really simple to make, but you should make a few checks before you start. Firstly you want the Mover to fit nice a snug inside the toilet roll. Ours fitted perfectly, but if you can't find one that fits well, just make your own by rolling a piece of card around the Mover into a tube. Secure with some tape. 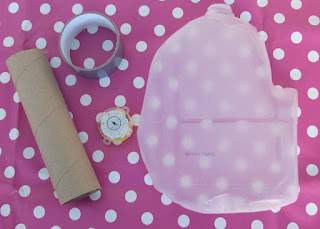 Cut out a large flat piece from the milk bottle. Roll it, to create a point on end and a larger opening about the size of the toilet roll on the other end. Secure this with some sticky tape. 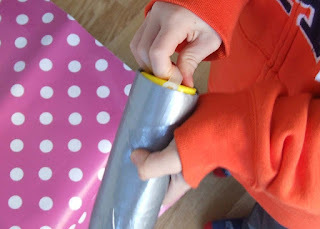 Now secure the plastic cone to the cardboard tube with the silver duct tape. 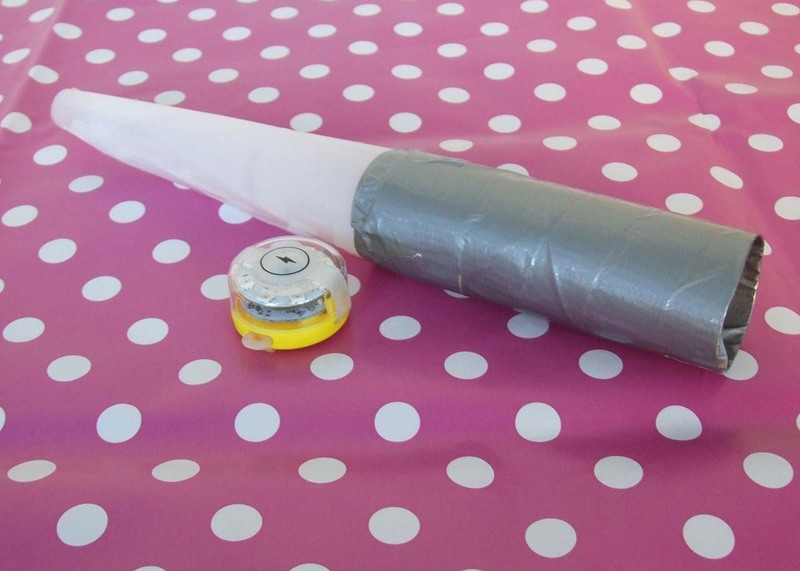 Keep taping the whole cardboard roll to create the handle for the lightsaber. 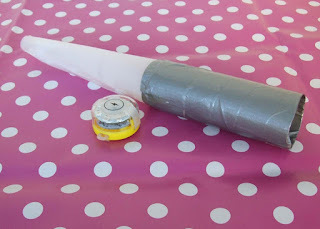 Once you've coded your Mover, you can slide it into the tube with the LEDs facing up towards the plastic cone. We wanted to make a blue lightsaber, to represent the Jedi. My son selected two tones of blue to code the Mover. We also wanted the lightsaber to turn on when it is pointing forward and off when it is in the up or down position. This is really easy to do with the Mover. 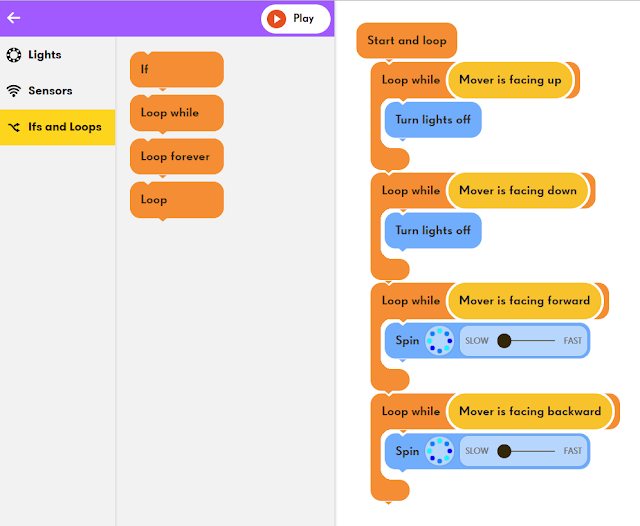 Below is a screenshot of our code. We found the code is a little bit laggy, so when you "strike" the blue light doesn't come on immediately. Unfortunately we couldn't control this in the code.